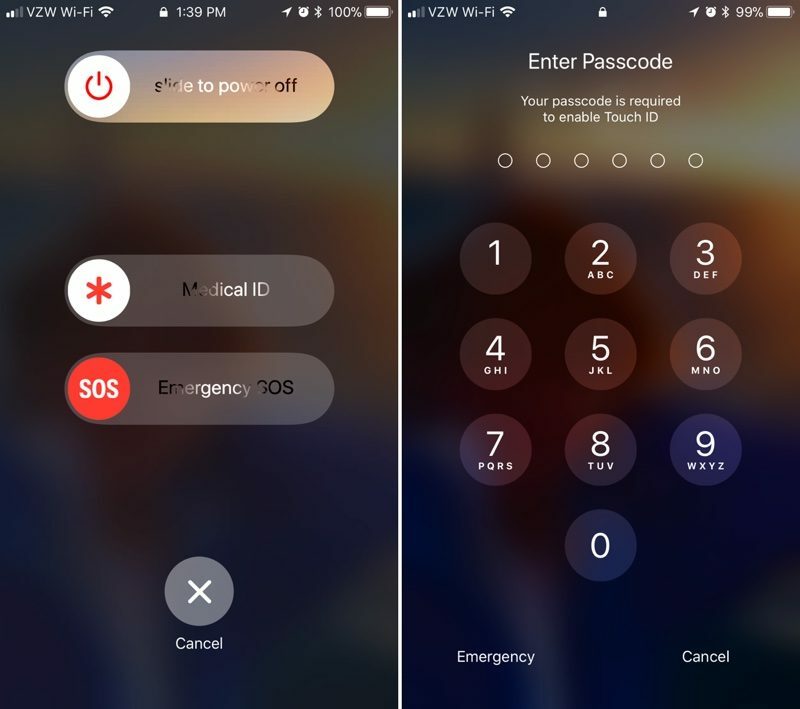 In iOS 11, Apple has added an "Emergency SOS" feature that's designed to give users a quick and easy way to summon emergency services should the need arise. As it turns out, there's a secondary benefit to Emergency SOS - it's also a way to quickly and discreetly disable Touch ID. This is a handy hidden feature because it allows Touch ID to be disabled discreetly in situations where someone might be able to force a phone to be unlocked with a fingerprint, such as a robbery or an arrest. With Touch ID disabled in this way, there is no way to physically unlock an iPhone with a finger without the device's passcode. It's also worth noting that there's no real way to tell that Touch ID has been disabled in this manner. Once you hit the sleep/wake button and then tap cancel, it's locked in the same way and with the same message that the iPhone uses when it's been more than 48 hours since a device was last unlocked with a fingerprint. Apple's Emergency SOS feature will be available on all iPhones that run iOS 11. Along with disabling Touch ID, SOS can also be used to summon emergency services and alert your emergency contacts when an accident occurs. iOS 11 is available to developers and public beta testers at the current time and will be released to the public in September alongside new iPhones. not that i plan on getting arrested any time soon, but good to know you can disable touch id. with the courts having ruled the police can compel a finger print but not you to give your passcode, it's a level of privacy that i like to see in there. This is a great idea, but why pressing 5 times? Surely 3 times would have been more than sufficient while making this action quicker and ultimately more usable. I think the five times is to prevent any inadvertent actions. It's a rather fast Motion pressing five times to toggle the function if you think about it. ZERO people will recall this feature exists, or how to activate it, when a situation arises. Utterly convoluted. A further innovation into discrete privacy. I like it. Apple isn't advertising it as such, but I think they did this to prevent law enforcement from forcing you to unlock with your finger (which they can do). They cannot, however, force you to give them your password. 3 taps is already an established function (reverse color) in iOS. Also, I accidentally do that function all the time when trying to do a double-tap, so it's a bad idea for emergencies. We’re talking about the power button, not your home button.